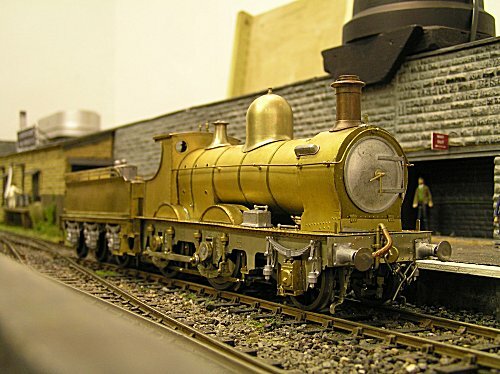 Mike has been an "O" gauge modeller for some years and his main interest is in the G.W.R. 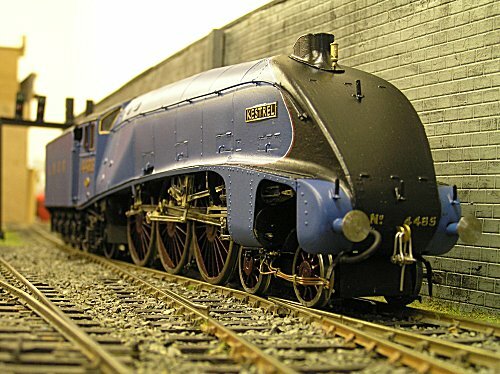 He has been a prolific kit builder over the years and many fine models have emerged from his Erecting Shop. A selection of his more recent models are shown below. Mike can also offer a kit building service - you can contact him on 01352 730374. All comments, positive or otherwise, by Mike. 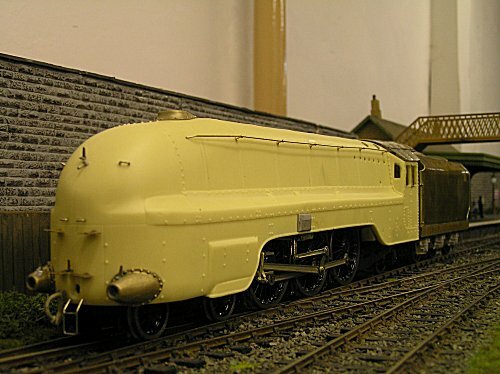 A3 LNER Pacific 60061 'Pretty Polly', as built by Mike. 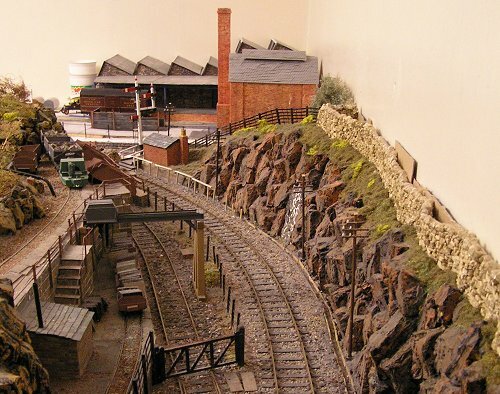 This is a view of part of Mike's O gauge layout which is still in the early stages of construction. 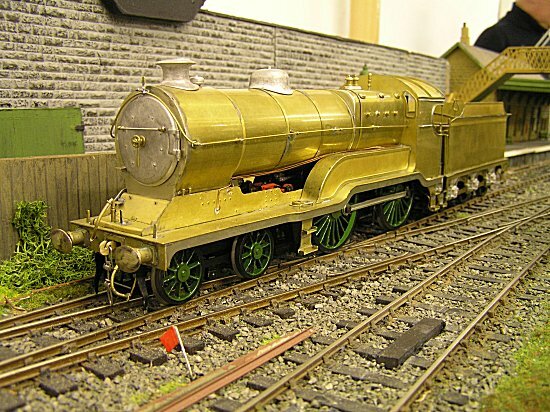 I've always been interested in kit building and kit bashing and a move up to "O" gauge provided a whole new dimension in which to develop my hobby. 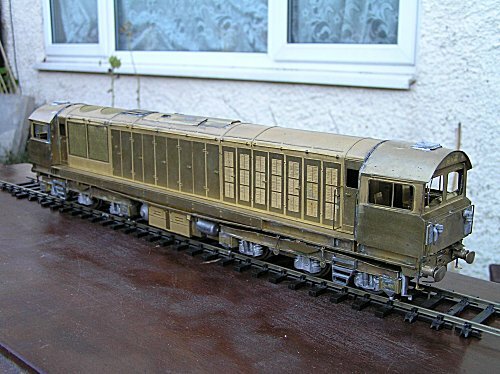 My first attempt in "O" was a Parkside Dundas 16T mineral wagon kit and a length of second hand Peco track. Try it - you'll be hooked! 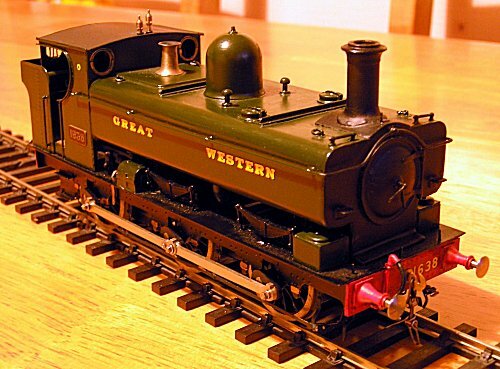 Great Western Railway Duke class 4-4-0 No. 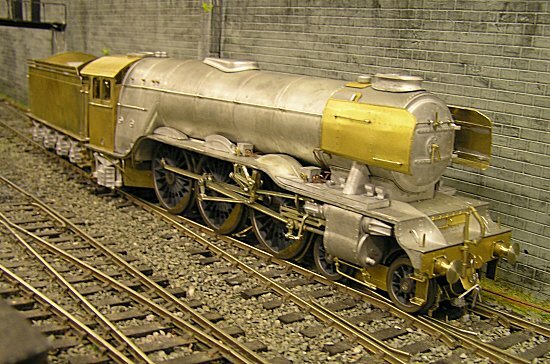 3256 "Guinevere". This was built from a MEGA kit for my own layout. The loco is finished in late 1920's guise but with a narrow cab. Class 45 No. 45132. 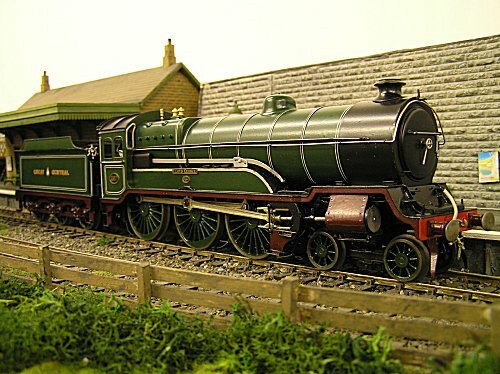 Built from a PR Models (ex Nigel Stanley) kit for my eldest daughter who loves these locos after seeing them on Bangor - Scarborough and similar workings in the 1980's. The kit was purchased after seeing one at a MIGO exhibition in Saltney. 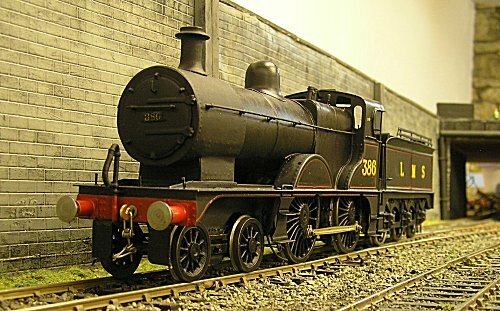 LBSCR K class 2-6-0. This came to me at the bring and buy stall at an O Gauge Guild show at Kettering. 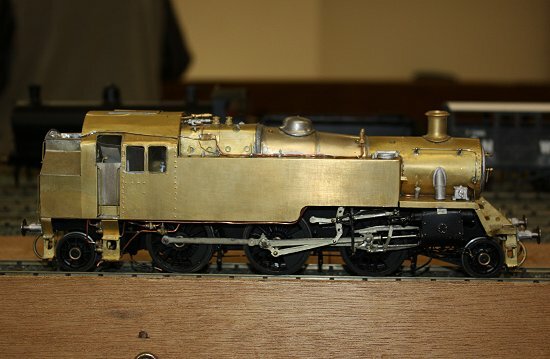 In a wooden box there was a completed loco chassis and a selection of "bits". Then followed 12 months of fun completing this fine looking loco. I hope my efforts have done justice to the beautifully built chassis. Finished in SR green and fitted with a 24 volt motor. 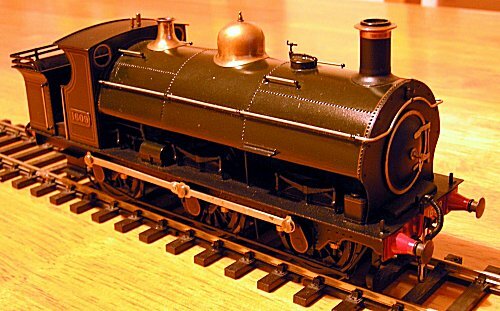 GWR 0-4-4T No. 34 - Great Western but different! 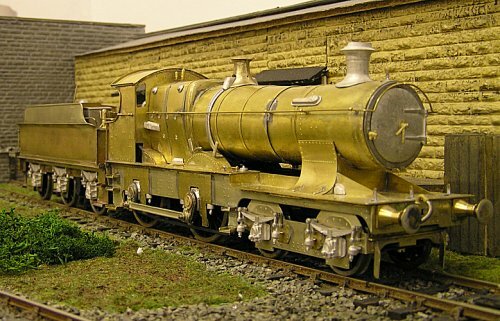 A scratchbuilt attempt to model one of the pair (34 &35) that worked the Helston and St. Ives branches at the end of the 19th Century. The locos ended up at Longmoor R.E. depot before returning to Swindon for scrapping after the end of WW1. 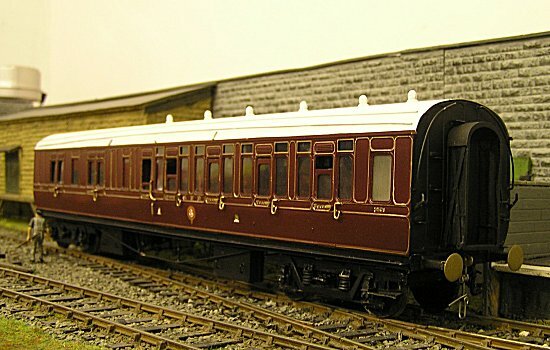 An eyecatcher with its train of four wheel coaches. G.W.R. saddletank No. 1609. Bargain of the century! Found at a Chester swopmeet, painted lined and ready to go. This machine gave me the inspiration to complete No. 1638 (below). Its still a bit of a mystery to me as to the makers of this kit though. G.W.R. pannier tank No. 1638. 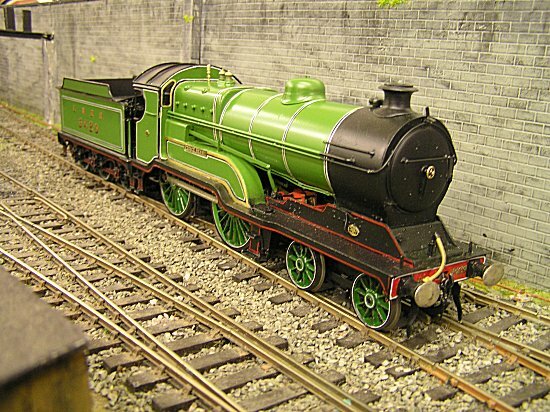 This was my first "O" gauge kit and is a MEGA budget one. It provided a very steep learning curve for a novice but the end result is a fine model of an outside crank pannier. pannier tanks. The locos were in service from 1870 to 1930.
but ultimately worthwhile. The end result is a heavy powerful machine. 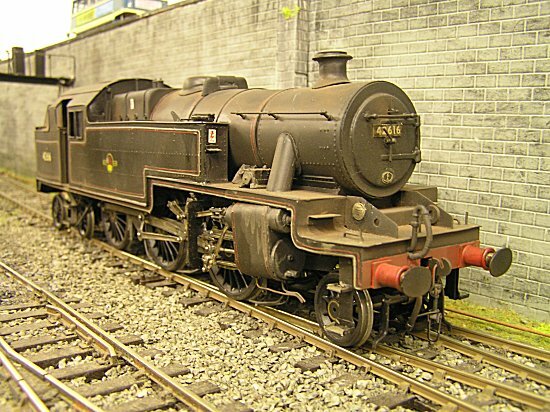 L.N.E.R Q4 0-8-0 No. 6176. 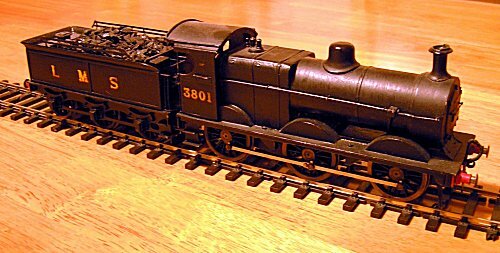 I bought some parts for a Leinster ROD 2-8-0 in December 2006 and decided to build the loco as a Q4 - the forerunner to the famous O4 2-8-0. 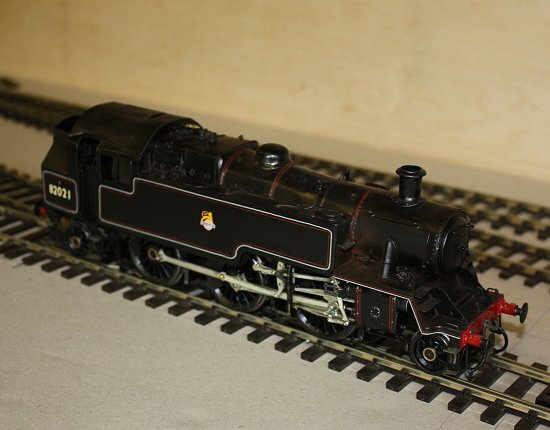 It is fitted with a Powermaster motor and it pulls just what an 0-8-0 should pull! The loco and tender are fitted with balance beam compensation, which works a treat and this was a very rewarding loco to build. Somerset & Dorset 7F 2-8-0 No. 13804. This is the small boilered version of this famous design. It is a JM kit and was a delight to build, there is lovely balance beam springing and a very effective MSC motor and gearbox. 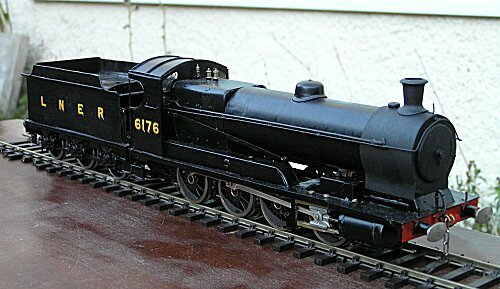 BR Class 4MT 2-6-2T No. 82034. 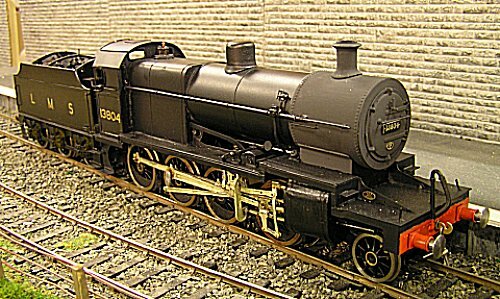 I remember seeing one of these locos as a child - it was love at first sight and I decided that one day I would build one. At a Gauge O Guild show in Telford I spotted a chassis fret on the Model Express stall and the project began. First a running chassis was made, then the body and about 3 years later 82034 rolled out of the paintshop. The loco has a 6E Chester West shedplate, its home shed in 1958. Foster Yeoman Class 59 No. 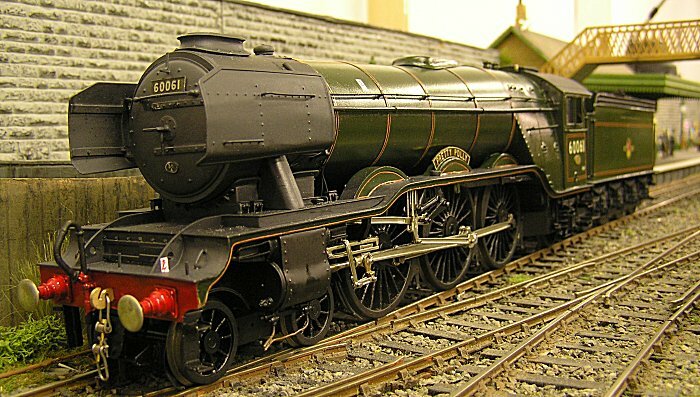 59003 "Yeoman Highlander". This project started off with another body fret at another Telford show. A modern image club member then provided me with the necessary inspiration to bring the project to a fitting conclusion. 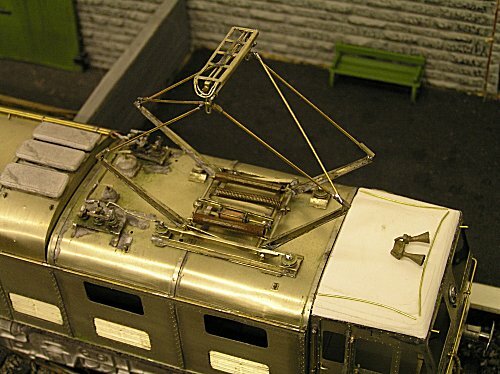 The completed loco has a motor in each bogie and hauls scale length trains with ease. The photos were taken at Mike Dunnings excellent Talacre layout. Great Eastern Railway Claud Hamilton 4-4-0 running as BR D16/3 No. 62597. 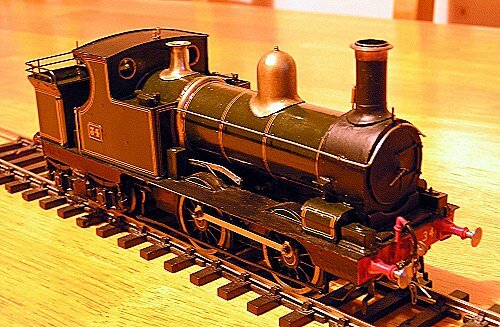 This model of a GWR 0-4-2 tank was constructed from a Scorpio kit. 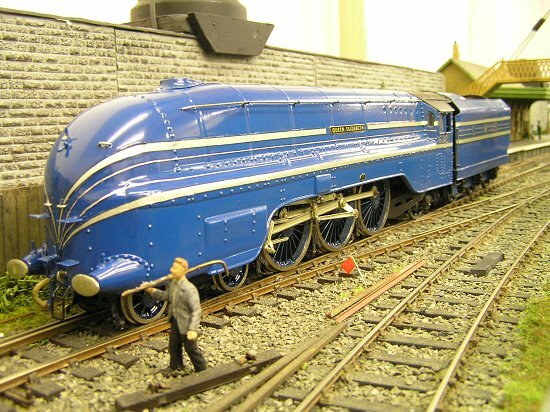 The loco was straightforward to build and is shown painted in 1930's style with a GWR roundel. 4804 is fitted for push-pull working and is ATC fitted. 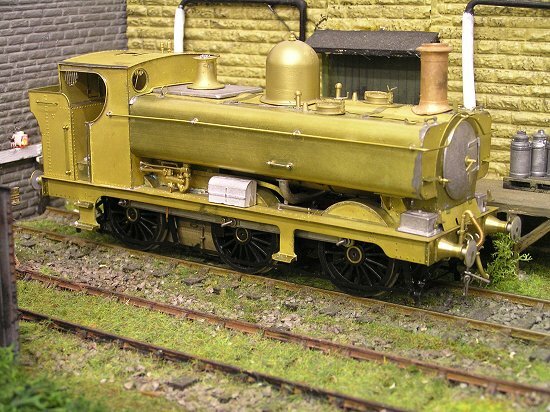 This is a GWR Bulldog Class 4-4-0 No. 3399 Ottowa. It was shedded at Chester and withdrawn in 1947. It was built from a Javelin kit - this came with excellent instructions and was a joy to build. 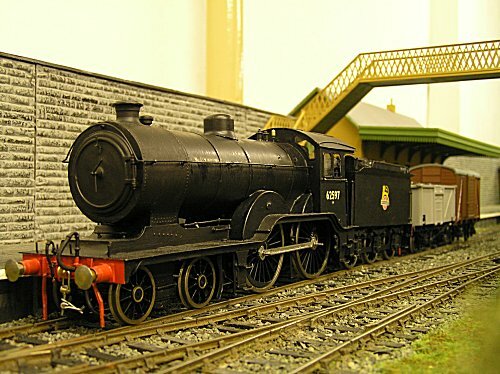 90763, a WD 2-10-0, started off as a boiler and wheel-less tender which I bought in Kettering 3 years ago. I have subsequently rebuilt the tender, smokebox and loco frames. The wheels are by Slaters and the coupling rods and valve gear by Premier. Powered by an MSC motor, No. 90763 pulls over 40 wagons with ease. 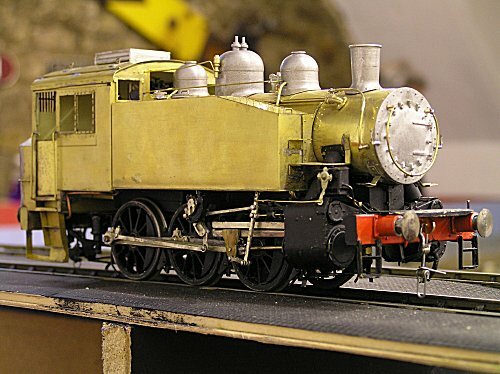 This model of a USA 0-6-0 tank was bought as a kit from Ebay. It turned out to be an old Oakville kit matched to Jim Harris bar frames. The frames were o.k. but the white metal castings were unusable. I had to build, from scratch, the slide bars, crosshead, lubricator and buffer beams. I also had to replace the bunker back and a host of other modifications. A very difficult kit. This project started with the purchase of a set of CCW frames. Also used in its construction were some early Slater's wheels, a Sagami motor, various Warren Shepherd bits and some nickel silver sheet. I'm rather pleased with the end result. 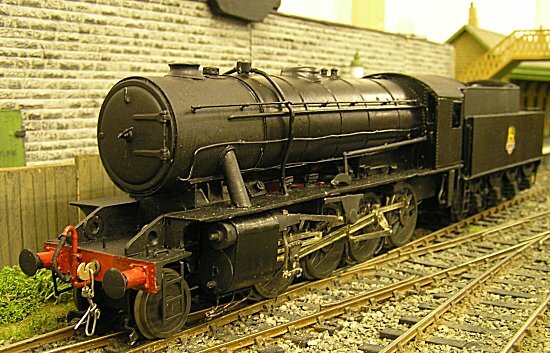 This is a Blacksmith Models GWR 57' toplight brake 3rd. It has been painted in Edwardian crimson lake livery by Dennis Morley (surely a genius?). The model has a detachable roof and full interior detail. A very satisfying model to construct. A P.R. 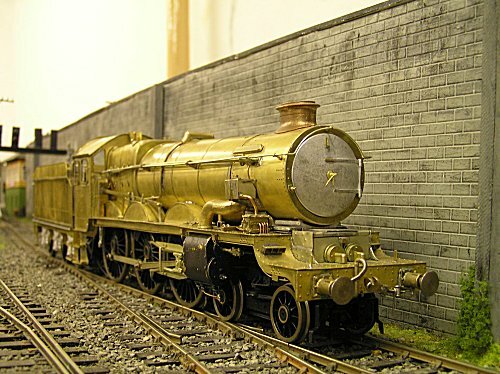 Model Railway kit, I like their kits, easy to build and as simple or as complicated as you wish. 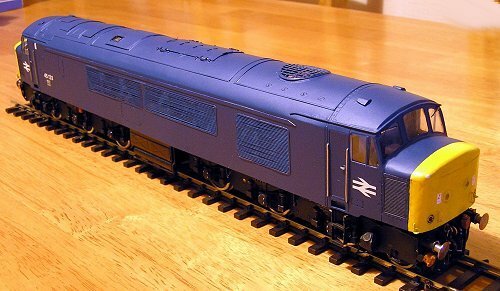 This one is fitted with scratch built cab interiors and is now running in Mainline blue livery. An MSL kit and by no means an easy one! There's a lot of work it out yourself in this one. A lot of research was needed for cab details, electrics, etc. But a handsome loco when finished. G.C.R. 9P class 4-6-0 "Lloyd George". 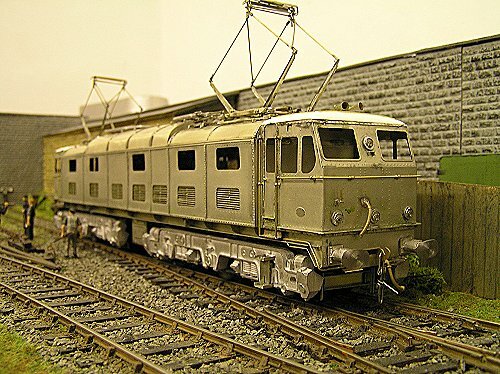 A David Andrews kit built for 3 rail coarse scale. A joy to build and painted by Jeff Howard. 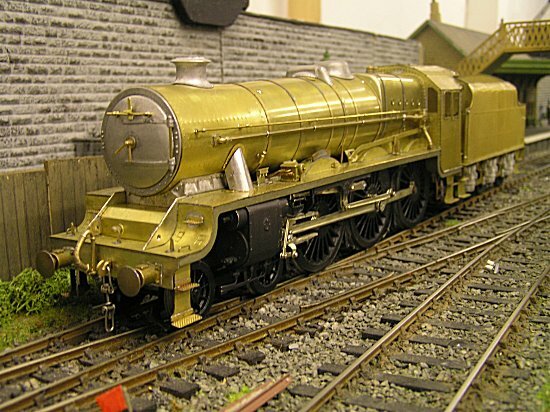 Another lovely David Andrews kit in as-built Royal Scot guise. Painted by Dennis Morley. This kit was a joy to work with, Mr. Andrews certainly makes very good kits. 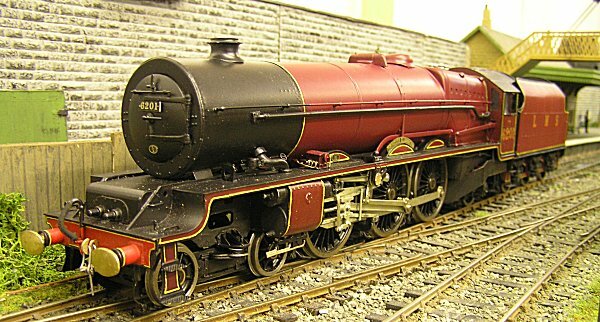 This kit of an ex Midland Railway 4-4-0 in LMS livery started off as an etch at a Chester swop meet. 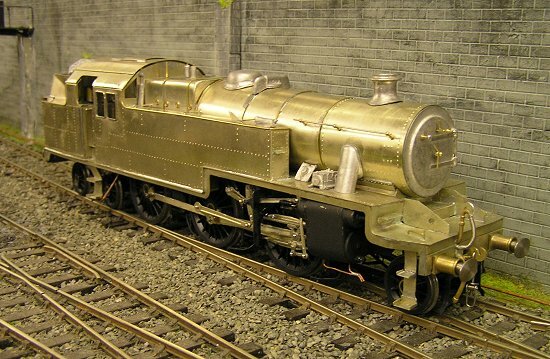 Some spare wheels, whitemetal castings and a scratch built tender and hey presto! a handy little loco for that 3 coach local. 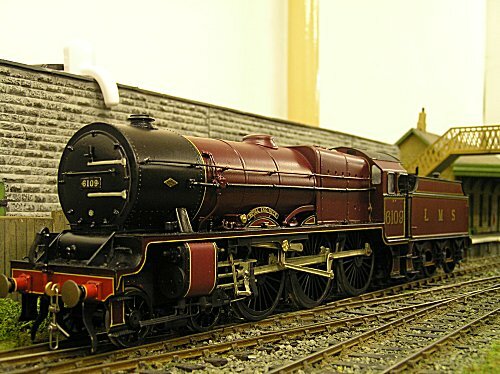 BR built Castle class 7014 'Caerhays Castle'. This is a Malcolm Mitchell kit, now marketed by 'Just like the Real Thing'. While it fitted together OK, this kit suffered from the lack of decent instructions - despite the 47 sheets of A4 paper! A lot of time was spent looking for information from other sources. A very complicated exercise which deserves proper instructions. 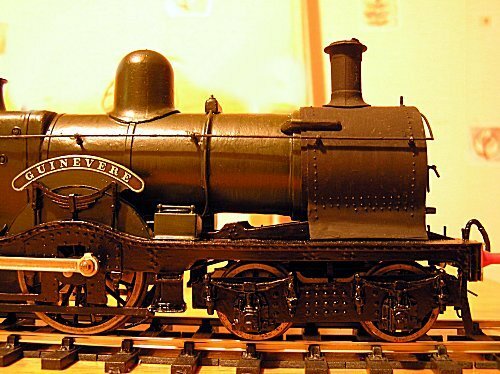 An LNER V3 2-6-2 tank. 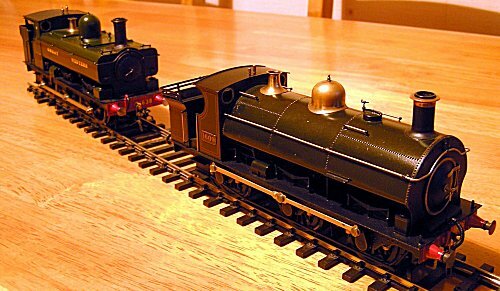 I enjoyed building this Gresley tank loco, it was a nice simple basic kit. It is fitted with an MSC motor gear box. 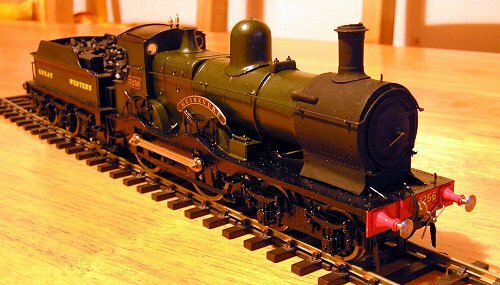 I made a few simple modifications to the smoke box saddle and have now got a good strong decent model. Another of David Andrews kits. A joy to build. I made this one for my third daughter. I hope the others don't want one! Below is the painted and lined completed model. 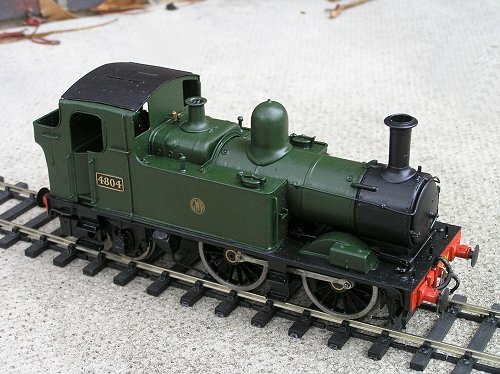 This Gladiator kit uses a resin moulding for the loco body. although i'm not a fan of resin it was definitely a time saver on this one! A nice kit - already for the paint shop now. L.M.S. dock tank 2F 0-6-0T. A nice kit from Mercian. A little head scratching required though on how to build the motion so that it is demountable from the frames. Other than that a delight to build. GWR 'Stella' class 2-4-0. A Martin Finney kit which went together absolutely beautifully. The loco has inside working valve gear which is a first for me. However after a little thought everything fitted perfectly. LYR 'Dreadnought' 4-6-0. 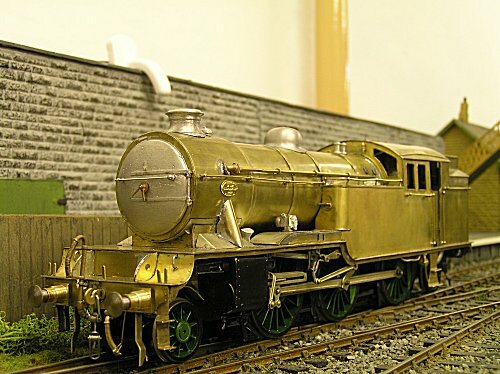 This Warren Shephard kit turned out to be quite a challenge especially making the cylinders and valve gear removable. 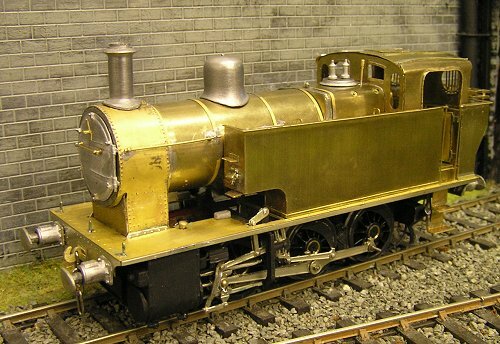 The end result is a rather impressive loco. Would I fit new frames and motor to this old white metal kit? Simple enough you'd think but think again. This one was the proverbial pigs ear! It's still not a silk purse but at least now the pig might have a bit of a pedigree! 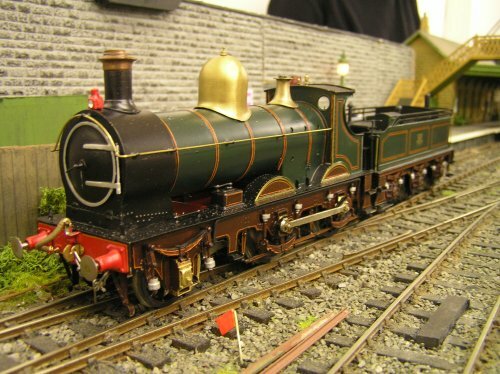 This Warren Shephard kit of the Great Western big prairie comes with some lovely martello castings, which really make it look the part. Following painting this Jubilee is to become No. 45585 'Hyderabad'. Another David Andrews kit fitted with a Maxon motor and ABC gear box. 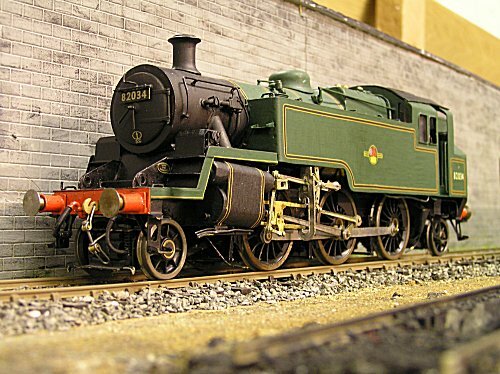 A Great Central Railway 'D10' class 4-4-0 from a David Andrews kit. Powered by an M.S.C. John Hart motor and gearbox and fitted with Walsall Wheels. The loco picks up current on the 'American' system, i.e. loco one rail and tender the other. Some say that Finney kits are over complicated. Maybe but only in respect of covering all variations made to the prototype. All kits should be this easy to build - well done Mr. Finney! A Meteor kit. When a friend asked me if i'd build a BR 82xxx tank I thought O.K. 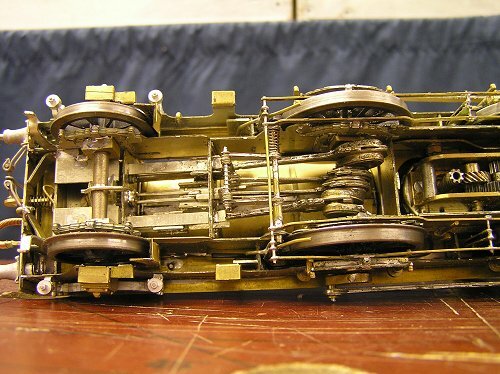 as I'd scratchbuilt one myself and had all the relevant info. After I'd opened the box, looked at the instructions, which didn't take long! and studied the contents, my first thought was: send it back and get your money back. But that's not entirely fair to the kit. If you've not built it then you are not in a position to pass comment. So off we go. After dealing with frame spacers of different lengths and a pony truck which is too long, we end up with a running chassis. Now for the body and this is where the fun really begins. Some parts too big and others too small, the firebox is simply unbuildable, the boiler too short and the bunker too wide and low. 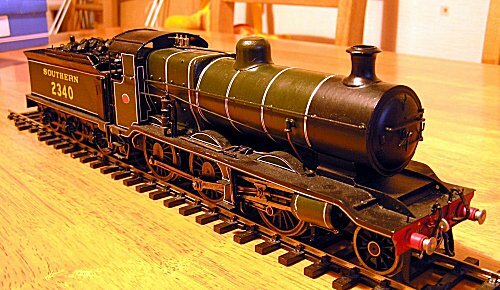 I end up having to make a scratchbuilt loco because of the vast collection of parts which won't fit together! This is the kit from hell! It had to go back into its box several times while I calmed down. Eventually, after endless frustration, it is ready for the paint shop, which was carried out expertly by Mike Cole. My conclusion is: send it back and get your money back! This kit is in a league of its own, the worst i've ever built. It should not be on the market. 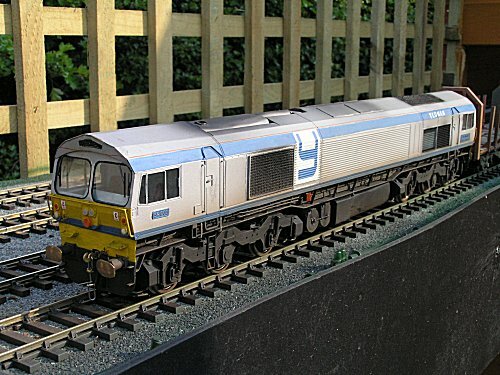 This DJH kit, after painting, is going to be 60042 'Singapore'. Shown here in it's final guise with double chimney and German deflectors. This is a good kit that went together with no trouble at all, well done DJH. 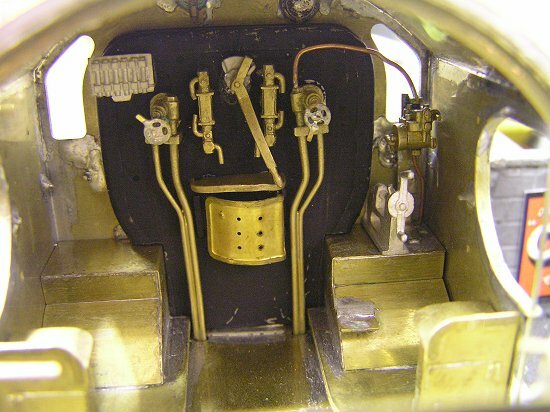 The only parts replaced were the white metal brake hangers by brass etches. Walsall wheels and an ABC/Moxon complete the model. 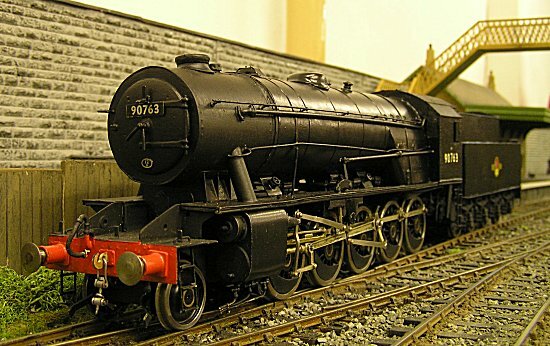 This Stanier 2-6-4 tank was built from an ACME kit. I read a write-up about this kit before I began so knew what to expect. The frame material is too thin, so strengthening the frames is essential. I used the coupling rods from the etch but the rest of the valve gear is awful! This kit is best described as 'an aid to scratchbuilding'. Does anyone test build these kits before they are marketed? 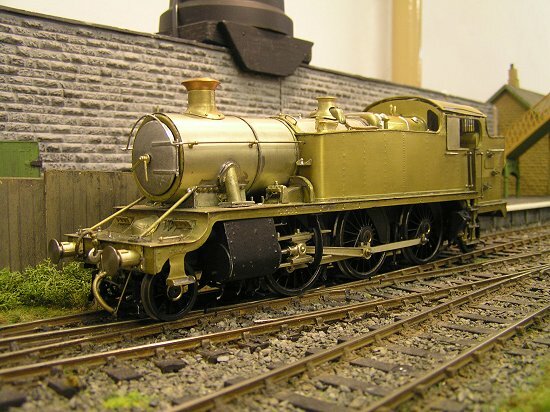 It may be a cheap kit to buy but after buying replacement valve gear and replacing other unusable parts, it's cheaper to buy a more expensive kit. Something that will be fun to build rather than trying to put this load of bits together.